Most of you adventure-types are undoubtedly familiar with Klim and their bombproof adventure gear. The stuff they make is about as high-quality as it gets, although not everything is necessarily practical for everyday use. 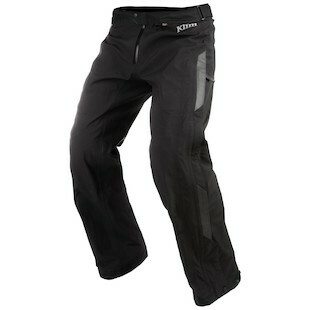 Well, for all you adventurous commuters out there, Klim has a new overpant for you. Say hello to the new Klim Torrent Overpants. The Torrent Gore-Tex Overpants combine the convenience of an overpant with the rugged construction and protection that we all expect from Klim. Don’t feel like fully gearing up, but don’t want to compromise protection? Look no further. The Torrent has D3O hip and knee armor, as is standard with Klim armored gear. It will keep you protected from the elements as well with its Gore-Tex 3-layer pro shell construction and 3M Scotchlite reflective material for visibility at night and in poor weather. On top of all that protection, the Torrent will be more comfortable to wear over your work clothes (or whatever else you decide to wear under them) than most other offerings, and they have large zippers to allow for maximum ventilation. You can adjust the hem using built in snaps, and an elastic back allows for easy movement. To top it all off you get waist adjustment straps. These pants can fit a wide variety of body shapes and sizes and as such should be very comfortable. Klim nailed it with this one, and I would recommend that anyone looking for the convenience of an overpant without sacrificing protection check these out. Whether you are a full time adventurer or an everyday commuter, the Torrent Overpants are versatile enough to be a great fit for anyone.